Have you been in a car accident? We are here to make sure that you’re getting the care you deserve. Comprehensive Chiropractic works with patients injured in motor vehicle accidents from diagnosis to rehabilitation. Every car crash injury will require a different treatment plan. We will make sure that you get the proper diagnosis and treatment for your specific injuries. Our chiropractor team of Doctor Knox and Doctor Wagner will determine what treatment is right for your body. On your first visit we do a through history and examination of your conditions pre and post auto accident. That visit we will decided if imaging is needed and we will begin treatment based on the examination. We have specific paperwork you can print and fill out (linked here) or we have it already printed out and available at our office. The claim number and adjuster’s name. 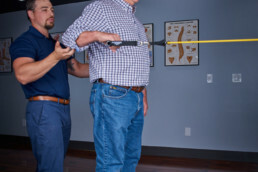 We offer a variety of different treatment options in our office such as Manual Adjusting, Low Force Adjusting, Activator Technique, Flexion-Distraction, Decompression, Instrument Assisted Soft Tissue Mobilization, Functional Dry Needling & Massage Therapy. 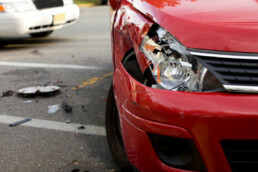 After a thorough exam and diagnosis, we will determine what treatments will work best for your auto-related injuries. We are able to bill your insurance if a claim has been made. We document all auto-related injuries and treatment to make sure you are compensated for the care you deserve. We may also refer you to get imaging done out of the house if necessary. Medical Payments or Med-Pay is an option offered by your auto insurance policy that pays any medical bills following an auto related accident. Med-Pay covers any passengers in your vehicle and each passenger in the vehicle is entitled to the entire amount of med pay on the policy. Learn more here. Delayed onset of symptoms after a crash is very common. We tell our patients just because you’re not in pain immediately after a car crash that doesn’t mean damaged didn’t occur. It may take a few days or weeks for car crash injury symptoms to show up. The sooner you get an exam and diagnosis after the car accident the quicker you can get back to 100%. People should be empowered with the knowledge and skills to maintain good health with confidence in their care providers. We also offer access to a referral network of other providers that specialize in car accident injuries depending on what your treatment needs. If necessary, we are able to recommend our auto accident patients to a network of personal injury attorneys that we have met with and trust that can help you with any questions you may have about the accident. Give us a call at (720) 458-0487 or email us here with any further questions about our Chiropractic Care for Auto Injuries. The doctors at Comprehensive Chiropractic can help. We are able to work with your insurance company and make sure your get the care you need. Fill out the form below and we will reach out for a free consultation as soon as possible. Were You the Driver of Passenger? Is a Lawsuit in Progress? Would You Like Us to Verify Your MedPay Coverage? How Can Comprehensive Chiropractic Help You?